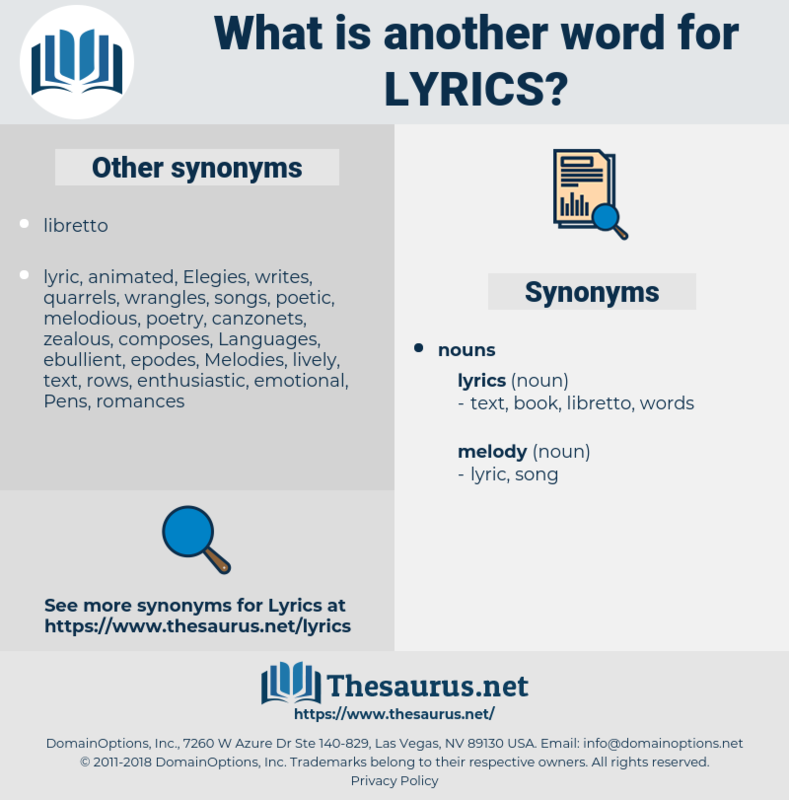 What is another word for lyrics? 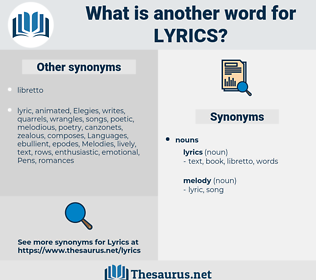 narratives, ballads, utterances, subparagraphs, singers, iyrics, pronouncements, writings, VOCALS, pieces, Sentiments, assurances, folksongs, letters, chansons, Voices, singles, scripts, humanities, expressions, Intentions, songwriters, excuses, wordings, Characters, remarks, lettres, statements, sentences, Essays, enactments, terms, comments, bills, issuances, drafts, Tracks, phrases, paroles, thoughts, speeches, opinions, statutes, arts, hits, tunes, textes, things, fonts, tongues, LINEs. What is still more important for us to note is that these lyrics were strophical and that they were no further removed from the folk song of the era than the frottola was. In Washington the Piatts were writing some of the most beautiful verse of the war, and Brownell was sounding his battle lyrics like so many trumpet blasts. largish, larousse, largess, largesse, largo, larch, low-rise, lyrurus, large, lorca, lauraceae, lark, lurch, larix, larus, leresis, layer cake, laurus, laurasia, lorica, lurk, lowercase, lower jaw.